In sunny weather, the calm pools of water in Nongriat are the perfect place to bathe or relax, their waters typically shallow enough to stand in. 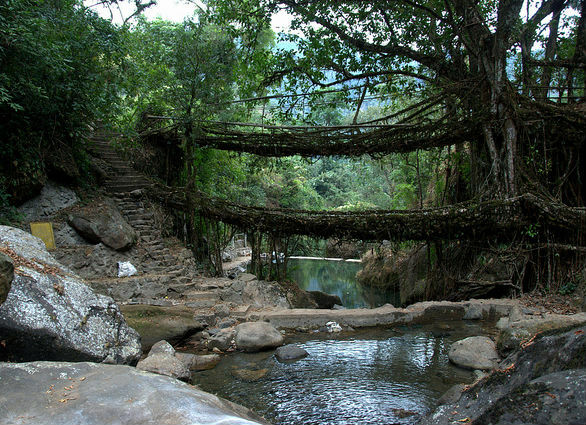 But this peacefulness is rare, and when the rain comes – as it so often does – the locals need bridges that are stronger than steel in order to cross. Their solution? Growing their own. 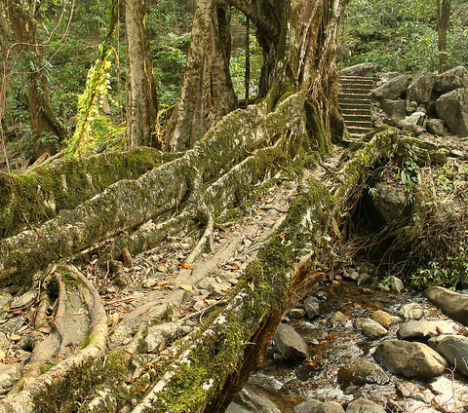 A native species of rubber tree is the ideal medium for living bridges that can withstand rivers that run with deadly force. 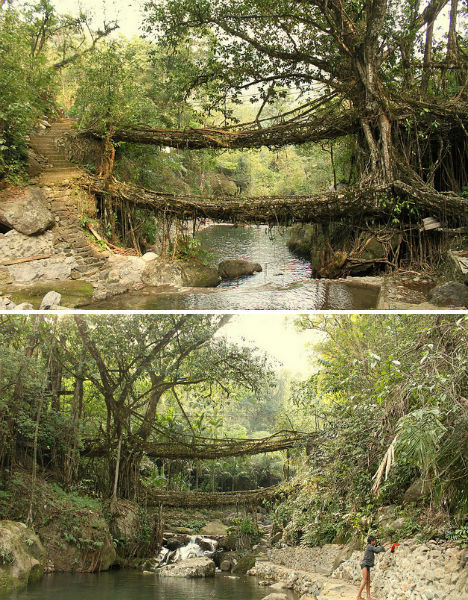 This area of Meghalaya, India gets an astonishing 49 feet of rain on average each year. Flash floods come quickly and without warning. 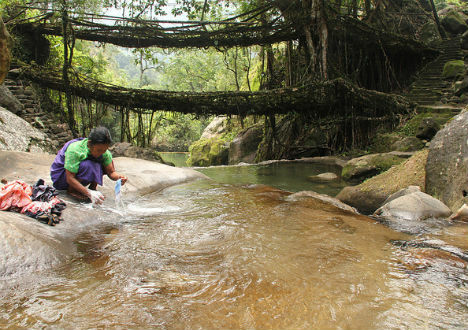 So, long before modern engineers began designing the kinds of bridges that could hold up to such conditions, the locals here found a way around the problem. For 500 years, they have been manipulating the secondary roots of the ficus elastica, which grow along the length of the trunk. The roots can be bent, twisted and taught to grow in certain arrangements. 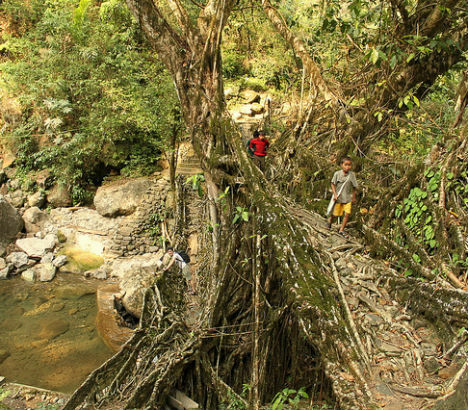 Using hollowed-out betel nut trunks as a lightweight skeleton for the bridge, the villagers encourage the roots to grow from one side of the bank to the other, creating a platform. Because the roots are living, they won’t rot, even in the face of constant moisture. 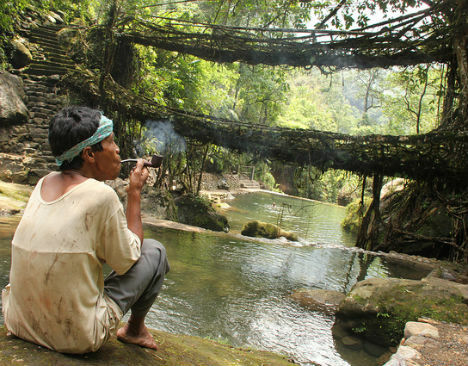 The bridges can support the weight of up to 50 people at once, and are even built in ‘double-decker’ form. It can take decades for them to stretch across a river or farm, but they continue to grow in strength.